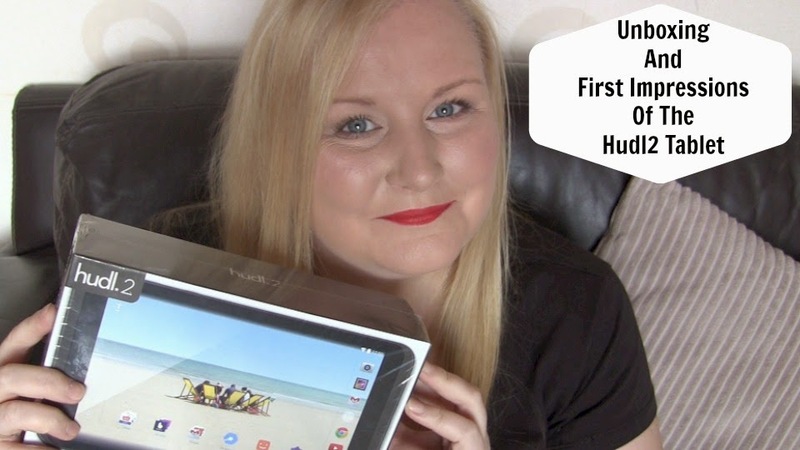 Today's blog post is all about the Hudl2 Tesco's own take on a tablet. I have never owned a tablet or even used one so when Tesco got in touch and kindly offered to send me one of their Hudl2 tablets I was over the moon. The Hudl2 is Tesco's own brand tablet, it is their newest version following last years Hudl. It comes in 8 different colours, Black, Blue, Turquoise, Orange, Pink, Purple, Red and White. There is also a micro SD card slot so you can expand your storage to up to 48GB if needed, there is also a headphone port. Like I said I have never used a tablet before so am a complete novice, I do have an iPhone 5 so am used to swiping up and down and clicking on apps but that's about as far as it goes. I found the Hudl2 really easy to use and from me turning it on for the first time it was super easy to get to grips with, and very self explanatory. There is a small instruction booklet that comes with it, but I'd say it was more of a tips book than an instruction booklet as it didn't really instruct me of much. I found using the Hudl2 for the first time really easy, it was easy to connect to our wifi and sign in to my Google account. Whilst filming the video I downloaded Instagram and Twitter and both downloaded very fast and I was signed in and using them in seconds, I love using Instagram on the Hudl2 it's so much better than on my iPhone, the pictures are clear and a great size and the same goes for Twitter too, it's super easy to use and much better than on my phone. Since filming I have downloaded more apps from the play store, and found it really easy to do, you can move the app icons between screens placing them where you'd like them too. The tablet comes with some apps already installed which is great, it already had You Tube which for me is great and it also has gmail amongst other things which is something else I use on a daily basis, and when I wanted to find some more apps to download the play store was really easy to use and find my way round too. As I said I downloaded quite a few apps from the play store, 2 of the apps I downloaded are BBC iPlayer and Netflix, I think the Hudl2 is great for watching films and TV series, the screen is a great size, it is bright and the volume is great. I love to use the Hudl2 for Instagram as I said and Twitter and it is also great for playing gaming apps, Simon is a Candy crush addict and loves to play it on the Hudl2, he also downloaded a Star Wars game which he said it brilliant to play on the Hudl2, he said the graphics are good and the colour and brightness plus volume are good too. I won't bore you with all the apps I've downloaded but I have found the Hudl2 great for all the apps I have downloaded, the play store is easy to use and the apps download quickly and can be moved around on the screen of the Hudl2 so you can place the icons where you want them. I have also used the Hudl2 for surfing the internet, I do 99% of my shopping on line so I have visited the sites I would normally use, I found the Hudl2 easy to use for surfing on line and also internet shopping, I have also googled a few different things to see how the Hudl2 held up with that too, I found it to be fast, google found the sites very quickly and once I'd clicked onto a site it was on the screen in seconds so I had no problems at all with surfing the internet. I also read my own blog and a few other blogs using the Hudl2 and had no problems at all with reading blogs or clicking any available links, viewing photographs etc. The Hudl2 comes with a selection of different wallpapers to use as your background but you can upload your own photographs to the tablet easily through your laptop or computer and use one of those if you wish, I found the settings really easy to use and found my way round them in no time. One feature I particularly liked is the Child Safety app, I don't have small children but as a parent I found this to be a really good feature of the Hudl2 tablet, you can create different profiles for different children and within those profiles depending on age you can block websites and apps you choose to and add a time restriction feature. I decided the best way to be able to tell you about the child safety app was to use it, and that's what I did. When you first go onto the app you can either choose to read some safety advice or create a profile, I decided to create a profile so I could tell you more about the app. When choosing to create a profile you are then asked to select a lock, there are 6 different lock methods, None, Slide, Face Unlock, Pattern, PIN and Password, obviously choosing none would be pointless but you do have that option, I thought it was good how there were more than the usual password option as this might not suit everyone. I selected password and then continued to make the profile, it asks for the child's name and age so I chose Zoe (original) and age 12. The first thing I noticed was the home screen only contained a couple of the installed apps including website, gallery and calculator, all the apps I'd previously downloaded weren't there and even when I clicked onto the button that shows all the apps on the Hudl2 it still only showed a few and none of my previously downloaded apps. The play store app icon was available but when I clicked on it it said it was unavailable for use so I couldn't get on it meaning as a 12 year old I couldn't download anything from the play store, again I thought this was a great feature. Another thing I like about the child safety feature is that for children aged under 11 social media websites and apps are completely blocked, I did mention in the video that Twitter and Facebook have an age limit of 13 and wondered why these are blocked from age 11 and under on the Hudl2 and I said in the video I would look into it so I have tweeted Tesco about it and they responded with, and I quote " Facebook and Twitter implement age restriction policies in order to use their services, this is not a Hudl issue" is it just me or is that not incredibly helpful? Maybe if a website or app has an age restriction the Hudl2 should block up to that age restriction? But as a parent you can also block certain websites and apps so should you not want your 12 year old to use Facebook or Twitter for example, you can block them very easily, this can be done with any app or website you don't want your child to access. I also thought the time restriction was a great feature of the child safety app, you can choose when your child uses the Hudl2, for example you could choose for the Hudl2 to be used on weekdays between the hours of 4pm and 6pm and all day at weekends but at the weekend only for a maximum of 2 and a half hours a day meaning your child cannot sit on their tablet until the battery runs out. I think that is a really good feature, each child has their own profile icon too and their photograph can be added if you wish. All in all I was really impressed with the child safety app, obviously it is ultimately a parents responsibility to take care of how and when their child uses a tablet but I think the child safety app is a brilliant feature and as a parent I was very impressed with it. Unfortunately I wasn't impressed with the camera on the Hudl2, I didn't find it to be brilliant and it wasn't as good as my iPhone, I sometimes use my iPhone to take blog photographs but couldn't use the Hudl2 as they just weren't clear enough I'm afraid. I also feel the same about the video aspect, I filmed a short video and the quality and sound weren't great for me, that said I do film my you tube videos on a Canon video camera so that should be good quality as it's Canon but even without the comparison to the Canon it just wasn't great at all I'm afraid so I wouldn't use the Hudl2 for photographs or videoing but to be fair I wouldn't buy a tablet of any description for the camera or video aspect anyway so this isn't a major problem for me. * I found the Hudl2 really easy to get to grips with, it was very self explanatory and I didn't get stuck with anything at all, I basically played around with apps and icons and found my way around the tablet very easily. * The play store is easy to access and apps were very easy to find and download. * The child safety app is fantastic and I was extremely impressed with it. * Watching films and TV programmes was easy to do, the volume and brightness are great but can be adjusted in the settings should you wish to do so. * The settings are easy to use such as changing wallpaper etc. * I was able to access the internet quickly and had no problems with google or surfing on line including on line shopping. * The Hudl2 was completely charged in a couple of hours and the battery has lasted well, no problems with charging or the battery life. * I found the Hudl2 easy to use for both reading and sending emails. * The selection of pre loaded apps are useful. * It looks sleek and is available in 8 different colours. * I didn't find the camera very good or the videoing aspect of the Hudl2 to be good. * The smudge proof screen isn't exactly smudge proof and the Hudl2 is now completely covered in marks and finger prints. * I didn't like the way the Hudl2 had to be updated and re started as soon as I switched it on for the first time, taking around 7 minutes. * I did find the Hudl2 to be a little heavy after a while but given my health that could be why. As you can see the pros far outweigh the cons, and the cons are pretty minor things really apart from the video and camera aspect should you want a tablet for that reason. I am quite fussy about things like finger prints and it drives me mad but it's hardly a first world problem, and the same goes for the having to update and restart the tablet when I first switched it on, neither are massive problems. And as for the tablet being heavy, I did manage to use it by putting it on a cushion on my lap. If you were buying a tablet purely for the camera facilities and video feature this may not be for you but for me as I said I wouldn't want a tablet to use as a camera or video camera anyway and if I had the tablet and was out and about and there was a photo opportunity I'm sure it wouldn't be so horrific I wouldn't be able to view it so again it's no biggie to me but this is a review so I need to point out the bad as well as the good. Overall I think the Hudl2 is a great little tablet, and to be perfectly honest had I not been sent the Hudl2 to review, I would never have bought one and was considering buying an iPad for Simon as his Christmas present but I am so glad I have had the opportunity to try the Hudl2 as it has shown me that there are other options out there for a lot less money that will do exactly the same thing that I'd want from any tablet. As an apple kind of girl I wouldn't have ever considered Android but having used the Hudl2 over the last few days I am really impressed with it. As I said I am a complete technophobe and I had no issues at all with any aspect of using the Hudl2, it was so easy to use and understand, and basically if I can use it, anyone can! Now all that's left for me to do is find something else to buy for Simon for Christmas! If you would like to purchase the Hudl2, you can find it here for £99, you can also purchase a wide range of accessories here should you wish. Have you tried the Hudl2? What did you think? If you have any questions regarding the Hudl2 or any app recommendations for me, please leave them in the comments and I will get back to you asap. Thank you for reading, I hope you found this post and the video helpful. * The Hudl2 was kindly sent to me for review purposes.